Partaking of unspeakable glory beside Christ. On the third Thomais sings what is meet and right with understanding. Saint Thomais* was from the island of Lesvos and was born in the early tenth century** from pious and wealthy parents whose names were Michael and Kali. They were childless, but by the grace of God and the intercessions of the Panagia, who appeared to Kali, they brought Thomais into the world. The Saint, pressured by her parents, was married to a man named Stephen at the age of 24. And because she was very pious and virtuous, she endured the barbaric behavior of her husband, who beat her severely every day for thirteen years, and truly was a "crown of thorns" to her. She was kicked, slapped, mocked, berated and burned, among other fierce torments. The Saint countered this temptation with prayer, patience, charity, doxology and thanksgiving. In return for enduring these trials like gold in the furnace, God glorified her and made her worthy of the gift of wonderworking. She also was given the power to banish evil spirits from the possessed. Her compassion extended especially towards prostitutes, whom she led to conversion by curing their diseases. From Lesvos both Thomais and Stephen moved to Constantinople. Her parents moved there as well. After the death of her father, her mother entered the convent of "Mikra Romaiou," or "Romaiou," and later she became an abbess there. Meanwhile, the daily trials and abuses of Thomais increased daily. Her comfort at this time was doing good for others and attending church services, most often at Blachernae, as much as she could, though she was often prevented from these by her husband. She especially did this at night, in order to pray for the salvation of the world. 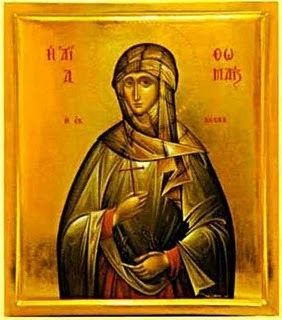 Saint Thomais reposed in peace at the age of 38 and was buried in the convent named “Mikra Romaiou”, or “Romaiou”, which was between Selybria and Polyandriou on the seventh hill of Constantinople. Forty days after her burial, her holy relic was uncovered and placed in a luxurious reliquary inside the main church of the monastery. Her body was incorrupt and on her honorable hands she bore wounds inflicted from her husband. In older times her memory was celebrated on January 1st, as the day of her death was the same as the feasts of Christ's Circumcision and Saint Basil the Great, but after the eleventh century the celebration of her memory was transferred to January 3rd. Her honorable body was lost, most likely during the sack of Constantinople by the Latins (1204). Her grave and her sacred relic became a spring of miracles. A demon-possessed man named Konstantinos, who approached her tomb, was healed. A paralytic named Eutychianos, who prayed and embraced her tomb, stood on his feet. A nun with terrible pains in the head was healed, and another with epilepsy was also healed. A fisherman found his torn nets in the sea filled with fish through her intercessions. A woman with terrible stomach pains was healed and from gratitude built a magnificent arch above her grave. It should also be noted that her husband, who after her death became demon possessed, was healed. They had placed him in chains and led him to the Saint's tomb and he was healed. * It should be noted that the memory of Saint Thomais had been forgotten for centuries, until 1961 when Professor John Fountoulis discovered her biography and other sources after a scientific inquiry. 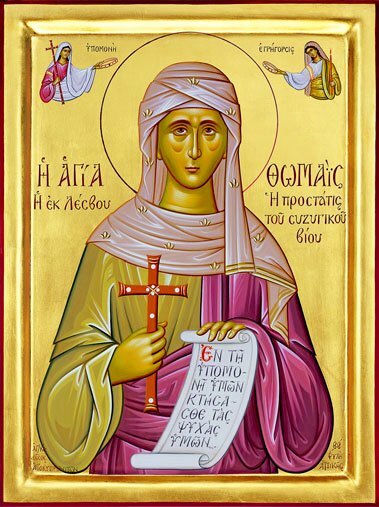 Monk Gerasimos Mikragiannanites composed a Service in her honor in 1967. ** It is said she was born some time between 910 and 913. For her complete life and many miracles, read here. For more details on her life and miracles in Greek, read here. The troubles of your life, as a rational offering, you offered to Christ, and the power of your miracles, O Venerable one, shined forth. Therefore as a a divine example of marriage, we sing praises to you O Thomais, and faithfully cry out: Rejoice revered ornament of the island of Lesvos. You bore much pain and maltreatment, all-wondrous Thomais, with strength in Christ; wherefore you were worthily glorified and received the crown of the Saints. Contending in the pains of martyrdom, Venerable Thomais, you put to shame the enemy, wherefore were you glorified richly by God, and dispense to those who ask you, your aid.